What makes Spirited Sisters Studio different? How much is a class and what is included? Can my party be seated together? What if the event I want to attend is sold out? Check out our calendar and find the painting you want to create. Everything you need is provided: canvas, easel, brushes, water cup and paper towels will be at your table. Tie on your apron, get your paints and you’re ready to go! Try to arrive 30 minutes before class starts. 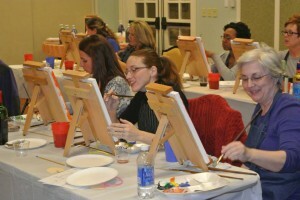 Find your seat, get your paints, get a refreshment, socialize, relax and get ready to have FUN! Our studio is owned and operated by a local artist. She has been painting for over 35 years and has a wealth of knowledge about the processes, techniques and materials. We hope you will leave us sharing our love and appreciation for art! We’ve invested in higher quality easels, brushes and canvases to provide a more authentic experience. Our canvases are medium texture cotton duck with standard 3/4″ solid wood and our sturdy, professional-grade easels allow you to adjust the height and angle to your perfect position. You will see evidence of our artistic knowledge and vast experience in our paintings. Some of our paintings may look a bit challenging at first glance, but our instructor will skillfully guide you in creating your own masterpiece. 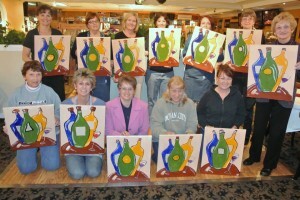 This is a 100% amateur art class. We’re not kidding when we say, “no experience necessary!” The artist will guide you step-by-step through the process of creating a finished painting. We’ll tell you which colors to use, which brush to use, and demonstrate how to make the brushstrokes and create the shapes. Experienced and non-experienced painters alike are always free to improvise and customize their painting to their own liking. 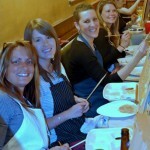 We will help you discover your inner van Gogh! The price of a class is $30 to $45 per person. For this you get a pre-stretched, primed canvas, acrylic paint and palette, brushes, professional-grade easel, artist apron and 2 hours of step-by-step instruction from a professional artist. We also attach picture wire to the back of the canvas of your finished painting so it will be ready to be proudly displayed in your home or office! The music and your instructor’s humor are also part of the FUN! Yes, you can reserve your space online and we do require a credit card payment when you make the reservation. Payment for a class is received through PayPal, but you do not need an account. When paying for a class PayPal will ask you if you have an account. Click No and it will guide you through the process to pay with any major credit card as you would purchase anything online. For those who are not familiar, PayPal is one of the top secure payment companies. There is a 48 hour cancellation policy. Although we are not hosting paint-ball battles or mud wrestling, accidents do happen. You will be working with acrylic paints that use a polymer binder. They dry fast and hard. The paint will come off your hands but not your new shirt. So, don’t wear anything you wouldn’t wear to a pie-eating contest. Let’s face it …splatter happens. This will not be a problem. If one person is registering for multiple seats, we will reserve that number of seats together. If individuals in a party are registering separately, just have one person contact us online and provide a list of the names that you would like to sit together. Send us a message online and ask to be put on the waiting list for that event (please be sure to include the number of seats you want). If space opens up, then we will contact the people on the waiting list in the same order that we received the requests. In addition, we will send you an email the next time that painting is added to the calendar so you will be able to register early for the next event!